Citroën C3 Picasso Running Costs, MPG, Economy, Reliability, Safety | What Car? 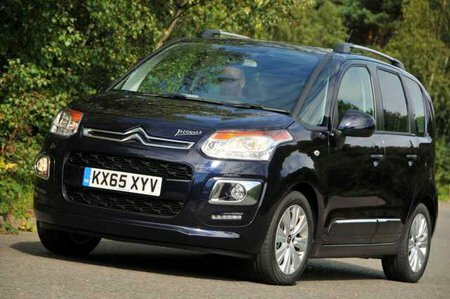 The C3 Picasso isn’t cheap, but Citroen dealers are famous for big discounts, so consider the brochure price merely a starting point for negotiations. The petrol engine is very economical and efficient, keeping down fuel and tax costs. If you’re doing lots of miles each year then there will be merit to opting for the even more efficient diesel, too, but you need to do the sums to make sure the extra economy will offset the extra cost. The diesel version sits in a low company car tax band, too, which may be another reason to choose it. Either way, servicing and fuel costs should be low. Just don’t expect the C3 Picasso to hold its value particularly well. You get plenty of kit, regardless of which version you choose. The basic Edition model comes with air-con, cruise control, Bluetooth and USB connectivity, electric windows and electrically adjustable mirrors. You can opt for an upgrade called the Automatic Pack, however, which adds dual-zone climate control, a leather-trimmed wheel, automatic lights and wipers, and an auto-dimming rearview mirror. Range-topping Platinum models get dual-zone climate, automatic lights and wipers, the auto-dimming rear-view mirror, heated door mirrors and a 12v socket in the rear. The Platinum models also have some optional extras, including black leather, sat-nav with a reversing camera and parking sensors. Citroen has an average reputation for reliability. This means that major issues are likely to be rare, but you might experience some smaller glitches. That said, the C3 Picasso has been around for a while so it may prove more reliable. Also, owners rated the car above average for mechanical reliability in previous ownership satisfaction surveys. Consequently buyers considering a Picasso shouldn’t worry too much. Each includes a three-year, 60,000-mile warranty as standard, as well as a 12-year anti-corrosion warranty and a three-year paintwork warranty. All feature stability control, ABS and emergency braking assistance to help maintain control and safety in tricky situations. Both Edition and Platinum models also come with front, front side and curtain airbags as standard, as well as rear Isofix mounting points. Both get cruise control and a speed-limiter, too. The Picasso scored four stars in Euro NCAP testing, but that was under less stringent regulations in 2009. Security experts Thatcham gave the Citroen four stars out of five for its defences against drive-away theft, but it performed averagely against break-ins, earning only three stars. Additionally, it has no spare wheel, and comes instead with a puncture repair kit, which is a shame. More often than not they don’t work, which could leave you stranded. Fortunately, if you’ve got a Platinum version, a space-saver spare wheel is available for a reasonable price.